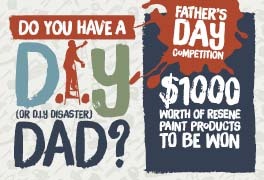 Do you have a DIY (or DIY disaster) dad? Thank you to all participants of the 2018 DIY (or DIY disaster) dad competition. We hope you had a wonderful Father's Day! Entries closed 2 September 2018. Winner will be notified by email. Prize includes $1000 Resene voucher and other goodies from Resene. The Resene DIY Card card entitles you to a range of discounts on products you will find in your local Resene ColorShop. Why pay full price when others are using their Resene DIY Card to pay less?